From now on Gold Members at my site will not only receive the customary 4 videos each week, but they will also receive it in written form. I have been a Gold member of this site for about 6 months now. 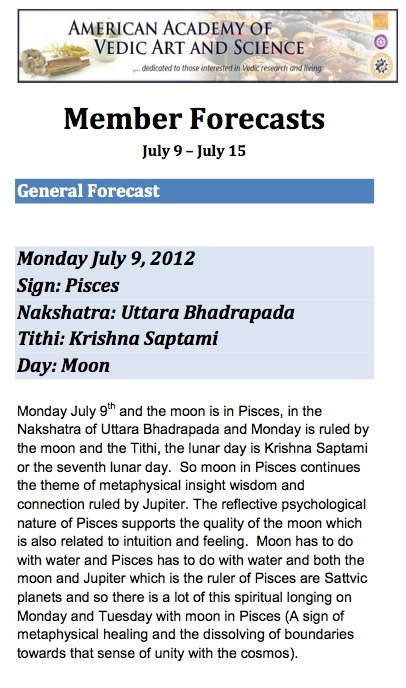 I look forward to every Monday when I get to listen to the forecasts for the week ahead – and as a student of Jyotish it helps me understand more about chart reading and how to synthesize all of the information. I also appreciate the new/full moon videos and that information allows me to set stronger intentions and be more connected to the cycles I am in. As a Gold member I also get to listen to the Universal Astrology Classes which truly helps my education go deeper and deeper. I also love the occasional specials and classes Sam offers at a discount for us members! I am very grateful for Sam and his dedication to his students. As an avid student of jyotish, I find Sam’s member site an invaluable resource of information, knowledge, a source of inspiration and ideas to open my consciousness to a deeper level of understanding and awareness. Sam shares his experience and wisdom with us generously and provides practical guidance to help us embrace the sacred teachings. The weekly videos are always relevant, educational and direct to the point. If you’re interested in expanding your knowledge of jyotish, vedic philosophy, yoga and the yoga lifestyle, you will find Sam’s Member Site a treasure chest full of gems! It’s unlike any other “member” site ~ here you’re encouraged and supported by those who care and welcome others. It’s well worth the affordable price of admission. I highly recommend! Sam is a remarkable astrology instructor. Can’t say enough about his dedication to his work, very humble practitioner while executing perfection always. Often times humorous in his approach as well. His loving devotion is obvious to all who partakes. Its been a privilege to be involved as a member, have been for quite sometime. 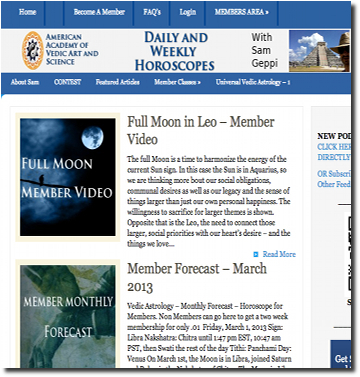 Really enjoy all of the variation of videos that is offered on astrological insights and transits. Cant wait to see his next one! Sam’s service is remarkable! It helped me so many times, especially to find my job right now (of course God’s grace behind it…). I mainly know myself quite well from many years of learning Jyotisha and practicing Yoga. So I am more interested in the transits and Sam’s positive ideas of interpretations to understand my situations and others inner processes better and being able to support them along their growth. I would not like to miss this special gift. Sam is wonderful at interpreting planetary transits & he makes everything very easy to understand. I tried to contact you previously but did not get an answer. Could you tell me if your membership fee is a one time fee of $39.99, or will I be billed monthly for this? How do I take my name off your mailing list? I don’t want to get your advertisements in the mail.